An iconic but once derelict mountain bothy in Glen Affric has been transformed into an eco-friendly rewilding base by Trees for Life – creating the springboard for an ambitious 25-year programme of forest restoration which will extend Scotland's Caledonian Forest towards the country's west coast. 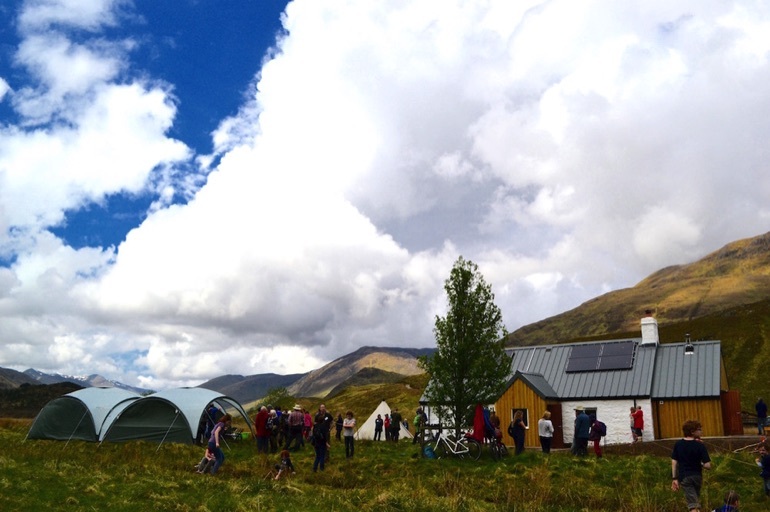 More than 100 people gathered at the remote Athnamulloch Bothy – which lies west of Loch Affric, on the National Forest Estate managed by Forest Enterprise Scotland – on Sunday 29 May to celebrate the building's £137,000 renovation, which has been funded by generous donations and grants. 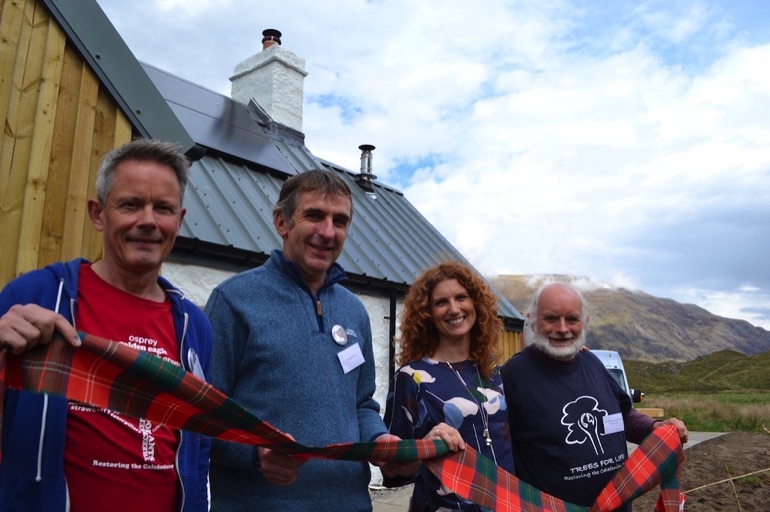 Broadcaster, writer and Trees for Life Patron Vanessa Collingridge officially reopened the bothy by a unfurling a ceremonial ribbon decorated with the tartan of Clan Chisholm, whose traditional homelands include Glen Affric. Environmental education charity Wild things! laid on activities for children, and guests were able to enjoy behind-the-scenes tours and a guided walk to the first trees planted by Trees for Life, in 1991. “Saving Athnamulloch Bothy from dereliction – and giving it an exciting new lease of life as a base for conservation volunteering to help rewild one of Scotland's great natural areas – represents a new era for our restoration of the Caledonian Forest in Glen Affric's western reaches,” said Alan Watson Featherstone, Trees for Life's Founder. Until the bothy became unsafe and was closed in 2008, Trees for Life's volunteers used it for 17 years as a base for planting the first new Scots pines to grow in the area for centuries. With significant tree planting in the remote location virtually impossible without a place for volunteers to stay, the conservation charity undertook an ambitious fundraising drive to save the bothy. In a major boost, almost half the costs were covered by a £60,000 award from the Legacy 2014 Active Places Fund, part of the Scottish Government's Commonwealth Games Legacy 2014 programme. Trees for Life secured the remaining funds through its Build the Bothy public appeal – fronted by broadcaster and wildlife filmmaker Gordon Buchanan – and further grants, including £20,000 from the Moray-based Gordon and Ena Baxter Foundation, £15,000 from The Robertson Trust, £10,000 from Garfield Weston Foundation and £1,000 from the James Thin Charitable Trust. Highland Council was also very helpful in enabling a building in such a remote location to meet today's stringent building control standards. The bothy has now been renovated to a high ecological standard while retaining its rustic character. A kitchen, living room, bedrooms, drying room, wood burning stoves, composting toilet and a bathroom with eco-friendly energy and water systems have been installed, new timbers and flooring have replaced rotten woodwork, and a porch now provides for drier entry into the building, which is crucial given the area's very wet climate. From Athnamulloch Bothy, Trees for Life is now launching its Back to Our Roots initiative. In partnership with Forest Enterprise Scotland, this will extend the native Caledonian Forest beyond its current stronghold in the east of the glen towards Scotland's west coast – creating a continuous corridor of woodland across this part of the Highlands, and providing habitats for many species long lost from these deforested landscapes.